Open Source Hardware provides hardware specifications like Open Source Software, which are publicly available,you can buy the smallest parts and build yourself. In the last century, Richard Stallman initiated the Free Software Movement, for whom, we are now using various softwares, services for free or at lesser cost; in the same way, Open Source Hardware makes the devices less costly, affordable and breaks vendor lock in. The free hardware is part of the free culture. Something to share a common hardware with software is that both correspond to the tangible parts of a computing system are components – electromechanical, mechanical and electrical and electrical wiring, cabinets. Some of the early initiation for the development of free hardware and Open Source Hardware was initiated in 2001 with the Challenge to Silicon Valley, published by Kofi Annan. Because the nature of the hardware is different from software, and because the concept of free hardware is relatively new, a precise definition of free hardware is yet to define instead Open Source Hardware is used as umbrella terminology. Since the hardware is associated with materials of variable quality and cost, any definition of free software can be applied directly without modification. However, the term free hardware has been used mainly to reflect the use of free software with the hardware and free information regarding the hardware, often including the release of the schematics, designs, sizes and other information about hardware. The design includes hardware and the distribution of elements on the mainboard. Free software gives the users four freedoms: freedom to use, study and modification, distribution and redistribution of modified versions. There are licenses that guarantee and give the legal coverage, such as the license GNU GPL. The free hardware take these same ideas of free software for application in the field. The biggest usage is in health science. A pacemaker costs like an atom bomb, but actually it has technology less complex than an entry level smart phone. Open Source Pacemaker is now available publicly. Other health related Open Source Hardware projects including Surgical Robotics are in consideration as a closed source surgical robot cost a huge, the companies run full monopoly business. It is pathetic for the end user – the suffering patient. However, more integration among the developers are needed through software repositories, more work, input is needed by the doctors who are interested in development. Other various applications of Open Source Hardware can be cited as example – Arduino for Controlling Motors, LED From Your Computer. That is good example of such Open Source project. 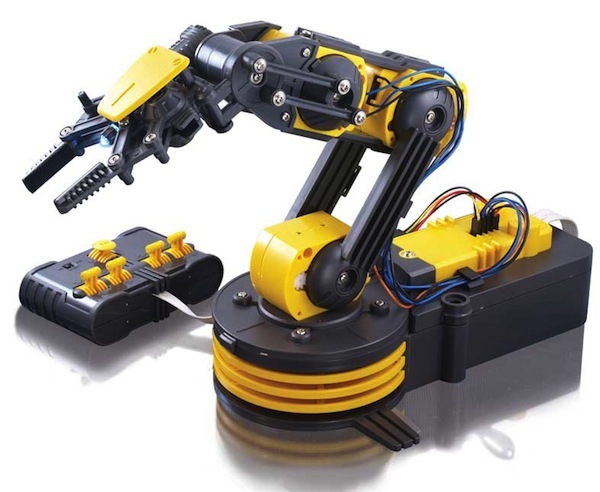 The image shows an advanced robotic arm (OWI-535 Robotic Arm), which was developed as a toy first; is also a product of Open Source Hardware movement and it costs around $45.00 only; a similar product manufactured by a big brand would cost 3-5 folds of the original cost. This Article Has Been Shared 6873 Times! Cite this article as: Abhishek Ghosh, "Open Source Hardware : Less Costly Works Best," in The Customize Windows, December 8, 2012, April 23, 2019, https://thecustomizewindows.com/2012/12/open-source-hardware-less-costly-works-best/.